Supernatural Underground: Romance In Fantasy Fiction: My Enemy, My Love & Laini Taylor's "Daughter Of Smoke and Bone"
Romance In Fantasy Fiction: My Enemy, My Love & Laini Taylor's "Daughter Of Smoke and Bone"
Last month, having started with The Lord of the Rings, I promised to return with a Fantasy novel "where love is far closer to the core of what makes the story tick." 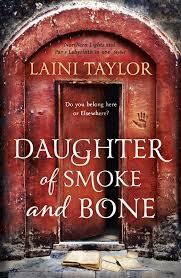 Which was an easy-peasy choice since Laini Taylor's Daughter of Smoke and Bone is not only a favorite of mine, but the love between protagonists' Karou-Madrigal and Akiva is absolutely the center of the story. "Once upon a time an angel and a devil fell in love. 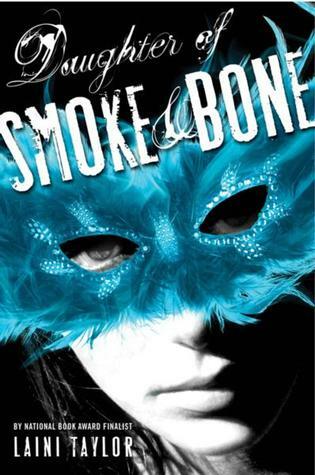 As well as ticking both the Fantasy and Romance boxes, Daughter of Smoke and Bone includes elements of "time slip", which is popular in historical fiction, and also past lives affecting the present, so there's plenty to give the storytelling interest in that respect. The basis of the story is this. Karou, a young woman living in Prague, with blue hair and hamsa tattooed on her hands, encounters Akiva, a seraph warrior who is burning black handprints onto secret doorways in the human world. From first meeting, they feel a sense of connection, although Karou's instinctive reaction to Akiva is "enemy, enemy, enemy", while Akiva learns that Karou knows those who dwell behind the secret doors: his enemies, the chimaera or beasts. Eventually, Karou and Akiva work out that they were once lovers, when Karou was the chimaera, Madrigal -- a love that crossed the bitter divide of the war-to-the-death between seraphim and chimaera and transgressed the codes of both their peoples. 'His head bent toward her, his mask muzzle brushing her ear. In his nearness, there was an aura of warmth. He said, "I know who you are. I came here for you."... His face was only inches from her own, his head tilted down so that now she could see into his mask. His eyes blazed like flames. Daughter of Smoke and Bone has a whole raft of great secondary characters, too, such as Zuzana and Brimstone -- there are definitely no "cardboard cutouts" in this book. And I have to mention the lyrical writing, which enhanced the beauty and mystery of the story. So whether you love Romance or Fantasy best, I think you'll find a lot to like in Daughter of Smoke and Bone, which was definitely an easy choice for my #YOR: Year of Romance and #RIFF: Romance in Fantasy Fiction bookshelf. I'll be back on 1 May with another personal #YOR #RIFF favorite. In the meantime, be careful out there -- and keep reading!